Thank you for choosing 1 or more of the following Teacher resource documents. 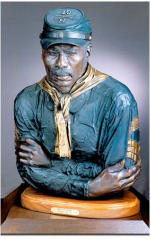 We feel you and your students will be truly engaged to learn more about the exciting world of the Buffalo Soldiers. A note: Most of these documents are in .pdf format. If you do not have Adobe Reader downloaded, you may download it for free at the bottom of this page. When completed downloading your selected files, please be sure to click the Yes, I want My Free Gift button. Color a Buffalo Soldiers here! Download Buffalo Soldiers Museum Quiz here. Accompanying audio in MP3 format. Download Buffalo Soldiers WWII Quiz here. Click > Buffalo Soldiers to review and download a variety of Lesson Plans, Worksheets, Puzzles & Games and more, for your 4th and 7th Graders. variety of Lesson Plans, Worksheets, Puzzles & Games and more, for your 4th and 7th Graders. Buffalo Soldiers themed Word Search, including answer sheet. Texas Ranch House, a photo gallery of historial pictures of the Buffalo Soldiers, brought to you by PBS. A 2-page .pdf providing some background history of the Buffalo Soldiers role within the California National Parks.